Editor's Note: This post was originally published in July 2014 and has been revamped and updated for accuracy. Rock climbing in the Sacramento area isn’t just for grown-ups. We want even our smallest family members to benefit from the heart healthy, confidence boosting workouts available at California Family Fitness, and our indoor rock climbing walls are a great entertainment and fitness value for kids of all ages. 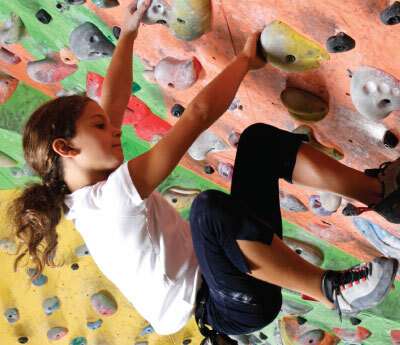 Here are 4 ways your kids will benefit from the rock climbing walls at Cal Fit. Growing up can be scary business! Allowing kids to move outside of their comfort zone in a safe and controlled environment will serve to build confidence, promote self esteem, and teach kids that overcoming fear is a healthy part of life. The rock climbing walls at Cal Fit are designed with safety in mind and offer all the latest safety gear, so even slips and mistakes can be a valuable and fun learning experience. With so many different routes to the top of the ‘mountain,’ kids get the opportunity to test out their problem solving skills, and learn how to negotiate the smoothest route to victory. Indoor rock climbing is a great puzzle to be solved, and kids have fun trying to figure out the best way to navigate the path to the top. Stretching little minds toward creative solutions is great practice for facing challenges on the path of life. Climbing walls require strength, flexibility, and coordination to successfully maneuver. Practicing the skills to ascend a rock climbing wall naturally builds a functional, core-driven skill set that helps aid in all other sports kids may want to play. From football to soccer, and tennis to swimming, core strength and flexibility are a valuable part of playing safe and injury free. Stay Fit While Having More Fun! Rock climbing gyms are just plain fun! It’s not only like a giant puzzle that just begs to be solved, indoor rock climbing is hard work too! This low impact, endurance-style workout is easy on the joints, and helps keeps kids moving and burning energy while they rise to the challenge, pulling, lifting, twisting, and stretching their way to a lifetime of fitness. If you want to get your kids involved in a sport they can enjoy for the rest of their lives, or just want to help them get some exercise this summer, visit one of our many Cal Fit club locations featuring a rock climbing wall, and get the kids started on a fun, challenging routine of rock climbing that will help them grow and develop, while having a blast at the same time! Make rock climbing for kids your next adventure with Cal Fit!